On Presidents Day, February 19th, 2018, Plant for the Planet Climate Justice Ambassadors and families from around the state of Washington came together for the Youth Lead the Way Climate Lobby Day. Here is a report from The San Juan Islander. The Seattle City Council Monday resolved to maintain and develop the environmental standards of the Paris Agreement. Before the vote on Monday, 12th of June 2017 two Plant for the Planet Climate Justice Ambassadors spoke in support of this resolution. 15 year old CJA Jamie Margolin spoke out for labeling Gas Pumps with Warming Labels about the effect fossil fuels have on the Climate. 11 year old CJA Azure Faloona urged the Council to support the resolution and discussed the scientific basis to keep warming below 1.5 degrees and CO2 levels below 350 ppm. You can find the full hearing at seattlechannel.org. And you can also read a summary at the Seattle Times. Email Rusty West to learn more or sign up and get our newsletter. Follow us on Facebook, Twitter, or Instagram to keep up-to-date with news and events. Donate to our good cause to save the world for kids and kids to come! The Climate Justice Ambassadors at Plant for the Planet are taking action against Climate Change. With our Three Step Plan (Planting 1 trillion trees, Stopping Carbon Emissions, and fighting poverty with Climate Justice) we can bring the Climate back under control, but we need everyone to act now! We do not have time for the White House’s terrible policies. Watch Climate Justice Ambassadors Athena Fain and Adonis Piper react to the news of Donald Trump announcing to pull out of the Paris Climate Agreement on Komo News. If you are (or know) a kid age 8 and up who wants to join PftP take one of our Academies to become a Climate Justice Ambassador (dates will be announced here). Even without that you can join our Seattle monthly meetings in Wallingford (1st Friday) and West Seattle (3rd Friday) – these are open to the whole family. At these meetings we will go through the calendar of actions coming up, for example: We have a low tide beach hike coming up, Public Speaker training (to give good interviews and talks), and many of us will join Al Gore’s Climate Reality Leadership training. In Fall we are getting ready for the next tree planting season. We’ll also continue to support our favorite local tree project Moving the Giants to Puget Sound. Email Rusty West to learn more or sign up for any of these events and get our newsletter. Imagine the impact your donation can have! 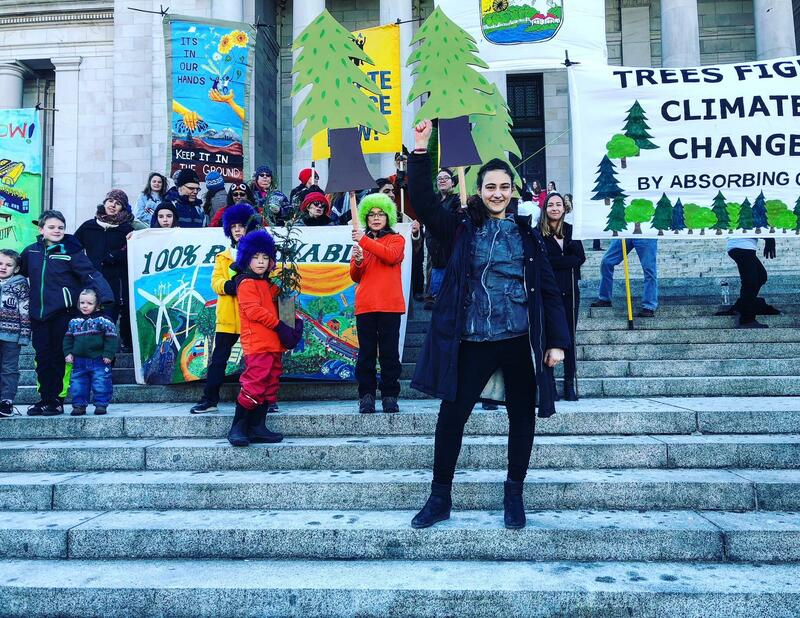 My name is Jamie Margolin, and I’m a 15-year-old climate justice ambassador with Plant for the Planet, a member of the Seattle People’s Climate Movement, and co-founder of Future Voters for 350 parts per million, a budding Teen environmental action network linked to Plant for the Planet. My name is Jamie Margolin, and I’m a 15-year-old climate justice ambassador with Plant for the Planet, a member of the Seattle People’s Climate Movement, and co-founder of Future Voters for 350 parts per million, a budding Teen environmental action network linked to Plant for the Planet. I’ve spent the majority of 2017 lobbying legislators in Olympia, speaking up at congressional town halls, including Congresswoman Jayapal’s very first town hall as a congresswoman, and organizing, planning, marching, and resisting my heart out. Like many of you, Election night left me brokenhearted, confused, grief stricken and terrified. I knew pretty much everything I cared about would now be under attack with a Trump presidency, but I decided to focus my resistance on what I believe is the most important and defining issue of our time: Environmental destruction and climate change. Because honestly, what will anything else matter when we don’t have clean air to breath or potable water to drink? So I joined Plant 4 the Planet, an international youth environmental nonprofit, and I got right to work, running around Olympia lobbying and meeting with representatives, testifying at 2 bill hearings before the environmental committee, and giving presentations on climate change. It was with plant for the planet that I learned how climate change is not this far-off issue that can keep being put off, rather, something that is right here, right now, and is the biggest threat humanity has ever faced and the defining issue of our time. And later, during my work with the People’s Climate Movement , I learned about the intersectionality of the climate crisis, and how climate change effects other issues and causes we care about. For example, if you care about civil rights and the Black Lives Matter movement, here’s a connection climate change has to systematic racism. Nationally 68% of the Black population lives within 30 miles of a coal plant, are generally more likely to live in polluted areas and have shorter life spans than Caucasians. Every issue, whether it’s poverty, public health, racism, or gender inequality, is worsened by climate change. Environmental issues are not separate from human rights issues at all. Having carbon levels in the air that increase childhood asthma and cancer levels is a violation of human rights. In fact, I think it’s fair to say that if there is one message that echoes forth from this rally, let it be that Environmental rights are human rights, and human rights are environmental rights, once and for all! Failing to address the issue properly is a crime against all young people (my generation) and future generations. We young people didn’t ask for any of this. We didn’t ask for or have any say in climate change, we didn’t ask for Trump –we have no vote– and yet we will pay the biggest price for his environmental recklessness, like his proposed budget. Trump’s proposed budget will slash the EPA’s budget in the Puget Sound by 93 percent and cut 3,000 jobs, many of which, are focused on restoring the Puget Sound, our home. But we are not just going to stand by and let this happen, are we? Actually, young people have already been on the front lines of environmental resistance. Youth plaintiffs all over the country have been suing their governments over this crime, slashing the myth that you have to be an adult to contribute to society, and participate in the resistance. Now why do I keep saying, crime? Well, it’s right in the constitution, that everyone has the inalienable right to life. It’s the most basic right we could ask for. But Climate change and environmental destruction are threatening those basic inalienable rights. The government has known for decades that climate change would threaten the lives of young generation, but they allowed companies to pollute and the problem to worsen anyway. So 21 youth plaintiffs from all over the country are suing the federal government over this denial of constitutional rights. Now here are a few quick numbers. Pre-industrial, natural levels of carbon in the air were 280 parts per million. Today, we’re at 405 parts per million. The level scientists say we need to get down to if we want to preserve life as we know it- and this level is a maximum- is 350 parts per million. But most bills in the Washington state legislature, like House Bill 1646, a carbon tax, which 350 Seattle and Plant 4 the planet is lobbying to amend, and we hope you will join our efforts, aims to allow carbon levels to rise to 450 parts per million. That’s not a solution! At 450 parts per million, the city of Seattle would be under water. Solving the climate crisis is not something we should maybe get around to sometime in the future, it is your constitutional obligation NOW, to ensure my generation has our most basic right to live. And starting right now, you can defend our rights. Because no matter what Trump does, here at home, we still treasure our natural resources and value our water and air. Everyone here should pledge to talk to our neighbors about the importance of investing in our environment – not slashing it! And that should only be the beginning! Get involved with organizations if you have the time, (Future Voters and Plant for the Planet is always in need of help), or get involved making sure public officials who are climate champions get and stay elected, like our beloved congresswoman, Pramila Jayapal! Plant trees, call your state and federal representatives about how much you care about the environment and your kids futures, they need to hear from you! A call only takes a few minutes, but it can really make a difference. Because everything we love is on the line right now, and we will need every bit of help from people of all walks of life joining in this effort. Finally, I think the most important part of environmental advocacy, is to remember that we’re not just trying to prevent catastrophe, but build and create a more peaceful and better world. So let’s root our resistance, and start building that better world right here at home! With the growth of Plant for the Planet (a youth-lead climate organization) in Seattle and enough Climate Justice Ambassadors in the South, we have officially kicked off our monthly West Seattle Meetings. Every 3rd Friday we’ll meet at 7PM at the Puget Ridge Co-housing Common House. The meetings in Wallingford will continue on the 1st Friday of the month. So the next West Seattle Plant for the Planet meeting will be on Friday, April 21st at 7PM. Children who would like to be active to get our planet back to a stable climate and their parents are always welcome to join. Please RSVP by email. Every child who wants to join officially can attend a one day, free academy: One is coming up on April, 8th in Marysville. Most importantly, we elected our two West Seattle Co-chairs Azure (11) and Tim (11), who will take turns planing and running the monthly meetings for the rest of the year. In their series PEOPLE V. CLIMATE CHANGE National Geographic gives us the latest update on Plant for the Planet: “Teenager Is on Track to Plant a Trillion Trees“. As you know, Felix isn’t doing this by himself, but he certainly started our powerful movement for trees at age 9. Join us 12/10/16 at the Jefferson Park planting of ancient redwoods! Seattle Parks and Recreation and Plant for the Planet invite the community to a planting celebration for redwood saplings on Saturday, December 10, 2016 at 10 a.m. in Jefferson Park (3801 Beacon Ave. S), at the southwest corner of S Spokane St. and Beacon Ave. S. Plant for the Planet, a world-wide kid-run organization of 8- to 14-year-olds interested in tree planting, keeping fossil fuels in the ground, and fighting poverty through climate justice will plant the redwood saplings and perform a world premiere “Be Like a Tree,” composed by the group. Redwoods are among the oldest, largest, most iconic trees on earth. 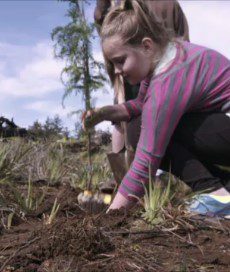 As part of the Moving the Giants project, 300 Coast Redwood saplings will be delivered to 26 communities around the Puget Sound from December to January. Many other communities are planning special events for tree plantings. These 300 Coast Redwood saplings have the same genetic structure as some of the world’s oldest and largest trees, have survived 3,000 years or more, and have the capacity to remove and sequester airborne carbon like no other species according to a team of researchers at Humboldt State University and the University of Washington. The redwood clones result from the work of Archangel Ancient Tree Archive – a Copemish, Michigan not-for-profit that collects, archives, and propagates the world’s most important old-growth trees before they are gone. Their work is described in a 10-minute award-winning film by Michael Ramsey called Moving the Giants – An Urgent Plan to Save the Planet. For more information on the event or this project please contact Philip Stielstra at 206-949-3804 or pstielstra@comcast.net, or visit the Moving the Giants to Puget Sound Facebook page at https://www.facebook.com/MovingTheGiantsToPugetSound/.